4:19pm: The Hawks have officially waived Lin, Chris Vivlamore of the Atlanta Journal-Constitution tweets. 12:41pm: Veteran point guard Jeremy Lin is in the process of finalizing a buyout with the Hawks, agents Jim Tanner and Roger Montgomery tell ESPN’s Adrian Wojnarowski. According to Wojnarowski, Lin intends to sign with the Raptors once he reaches free agency. Lin, 30, has played well off the bench for the Hawks this season after missing most of the last two years in Brooklyn with injuries. In 51 games (19.7 MPG) for Atlanta, he has averaged 10.7 PPG, 3.5 APG, and 2.3 RPG with a shooting line of .466/.333/.845. Although Lin was mentioned in a number of trade rumors leading up to last Thursday’s deadline, the Hawks ultimately didn’t find a taker, with his $13.77MM cap hit likely acting as an obstacle in negotiations. 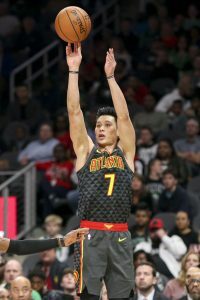 Once Lin remained on Atlanta’s roster through the deadline, reports indicated that the team was unlikely to buy him out, but it seems that stance changed within the last few days. By agreeing to a buyout with the Hawks, Lin will give back a little of his remaining salary with the Hawks, which he should make up when he signs with the Raptors. However, he’ll also forfeit the chance to earn possible incentives that were written into his previous contract, as ESPN’s Bobby Marks observes. When Lin was traded from Brooklyn to Atlanta last summer, a 10% trade kicker in his deal ensured that he received a $1.25MM bonus for this season, so perhaps that extra money helped convince him that it was worth surrendering some money in a buyout and giving up his opportunity to earn those incentives. The Raptors gave up five players in three deadline-week trades and only received one (Marc Gasol) in return, so adding Lin will help the club replenish some of its lost backcourt depth. While it’s not clear exactly what sort of role Lin will assume in Toronto, the Raps found playing time for three point guards before trading Delon Wright to Memphis, and both Kyle Lowry and Fred VanVleet have battled health issues throughout the season. There should be plenty of minutes available for Lin. After dipping to 10 players following their deadline deals, the Raptors have since signed Malcolm Miller and Chris Boucher, and are now poised to add Lin and Ben McLemore (10-day contract) to get back to the league-mandated minimum of 14 players. As for the Hawks, they’ll drop to 12 players once they officially part ways with Lin, so they’ll need to add at least two players to their roster soon. This the best case scenario for the Raptors! This will help a thin bench! Keep building, need a 3rd post, Kanter say who though! Nice signing. I was hoping this would happen. I thought ATL GM Schlenk wanted to keep him, but the Toronto opportunity is a fine one, with playoffs ahead for them and suddenly being thin at PG. I bet there was a giveback. Realistically the team does well with Lowry though. Of course the same thing could be said about Ibaka, and they got Gasol. Maybe they’re adding pieces with built-in rooting sections. They need a backup pg, and Lin can also play the 2 Same role he had in Atlanta backing up Young and playing alongside him at times. Opportunity for Jeremy to grow his brand and legend in the global marketplace with the bad ash playoff bound Raptors. Their boisterous fans will love him and it couldn’t come at a better time with Van Vleet injured. Front office in Toronto is stellar. Also, whatever the Raptors are paying him, they’ll make back tenfold in merchandise sales.